I feel very apprehensive about posting this but I’m doing so because I know so many people struggle and I want to show you all that I struggle too – you are not alone! Struggles can be both physical and emotional. I think my struggle is mainly emotional and it’s based on fear. As a yoga teacher I feel I should be able to do a headstand. Guess what? After over 10 years of yoga practice, I’m not there yet! This photo is my best attempt at a headstand so far and it was taken a couple of months ago. I know I have the physical strength to hold my bodyweight on my arms, so I’m convinced my challenge is a mental one. 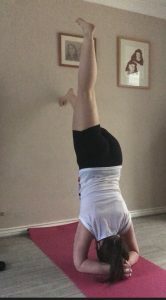 While I’m quite scared of headstands, I know if I keep practicing I’ll get there eventually. I just need to face my fear! This mindset applies to so many challenges that we face in life. Whether it’s yoga poses we think we can’t do, races we think we can’t run or emotional struggles such as anxiety and stress that we think we’ll never beat. As scary as it sounds, the key is to face your fear! What struggles would you like to overcome?